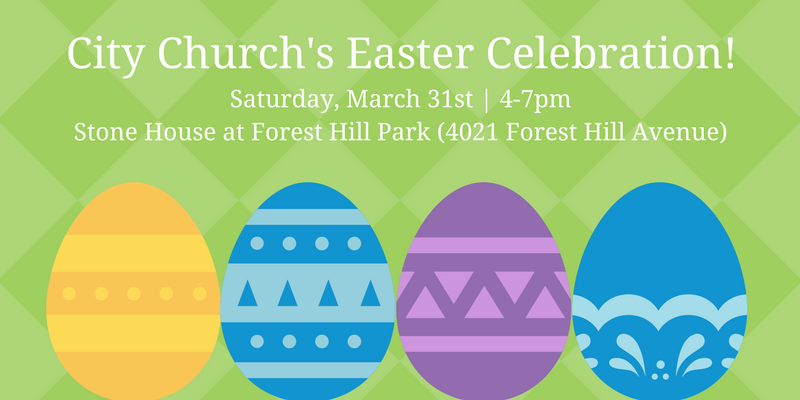 All are invited to join us on Saturday, March 31st, 4pm to 7pm at the Stone House in Forest Hill Park (4021 Forest Hill Avenue) for our annual Easter celebration. This is a wonderful family-friendly (but NOT family-only) event that we look forward to each year. It's great way to introduce friends and family to the City Church community, so please bring guests along with you—here's a PDF invite to pass along. The bounce house will open at 4; our egg hunt starts at 4:30; and dinner is at 5. City Church will provide the main dish, so please bring a side dish or dessert to share. To help us plan our meal better, feel free to sign up for a dish here.